A book review of the second edition of “Neuroscience For The Mental Health Clinician” by author Steven R. Pliszka. Explore why we recommend this book in the personal library of every mental health professional…more here! Looking for materials to help you learn more about the brain systems that underlie cognition, emotions, and behavior? Want to explore how disturbances in these systems can lead to psychopathology? In this brief review, we’ll review how the title “Neuroscience For The Mental Health Clinician” by Steven R. Pliszka can help. More on why you’ll want this book on your shelf, with a section for your comments or questions at the end. When you look at alcohol and drug use trends, substance use is most likely to emerge in the early adolescent years and reach its peak by young adulthood. After this period, numbers usually stay at a relatively consistent level, after which they decline as individuals reach late adulthood. Now, while many people will seek out treatment and achieve abstinence by late adulthood….what about the others? Decline in substance use prevalence as people age is due to the fact that many people die as a result of the toxic effect of alcohol and drugs after years of use. Q: What does neuroscience have to do with this? A: Almost every major mental health disorder carries with it the risk of substance abuse. The second edition of “Neuroscience For The Mental Health Clinician” by author Steven R. Pliszka is an impressive, detailed, and easy-to-understand guide to basic understanding of neuroscience. It gives and in-depth review of the essential must-knows for any contemporary mental health practice. In addition to incorporating a decade worth of important advances in brain science, Steven R. Pliszka also explores the current knowledge on the neurobiological bases of the most common major psychiatric disorders. The book also looks into the way treatments – both pharmacological and psychosocial – are used to address mental health conditions. Plus, the author describes how each of these treatments influence the brain and reduce symptoms. Accompanied by over 100 figures, charts, and illustrations (black-and-white and color), the book addresses readers’ visual learning. The book truly facilitates an understanding of the brain structure and functioning processes. What’s more, the author addresses the difficulties of pinpointing cause and effect: does a specific case of substance use disorder occur as a result of an underlying mental health disorder, vica versa? In addition to this, he outlines factors that cause or fuel the primary mental illness and the substance use disorder. What Is “Neuroscience For The Mental Health Clinician” About? The anatomy of the brain and its structures involved in cognitive, motor, and emotional behaviors. How the brain’s structures relate to each other. Neuronal communication and the complexity of the brain’s circuitry. The major neurotransmitters systems involved in the communication between neurons. How the way we feel (the processing of fear and reward) is tied to how we move (the circuits involved in action). Attention, memory, and the connectivity between brain regions. How higher cognitive functions, such as language and executive function, are localized in the brain. In the PART II of the book, each chapter specifically covers the following mental health disorders, their genetic and environmental origins, the brain anatomy of each, as well as treatment methods…in depth! But, although chapters are organized by disorder, it is made clear throughout the book that psychiatric disorders are not completely cut off from one another. 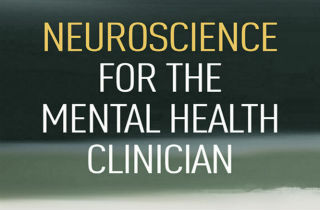 “Neuroscience For The Mental Health Clinician” is a book for any mental health professional. Although the title speaks to psychiatrists, all mental health clinicians, medical students, or psychology students can benefit from its inclusion in a personal library. Basically it is a book for all who encounter, or are preparing to work with clients every day in office settings. It outlines the neurobiology of common mental health disorders and is essential for the understanding and treatment of mental health. After all, mental health clinicians may need to brush up on their neuroscience. As the fields of Neuroscience and Mental Health advance, a basic understanding of neuroanatomy is crucial! So, for those with or without a strong neuroscience background, this book can make studying the matter more simple…without making it simplistic. 1. We feel that mental health clinicians are responsible for their knowledge base; staying informed about brain science is a professional imperative. 2. A new understanding of the complexity of the brain is essential to new developments in the treatment of addiction! 3. An estimated 1/3 of people who become problem drinkers or drug users experience co-occurring mental health issues. Foundational brain science is crucial to understanding the crossroads between mental health and substance use and will push the industry forward. We’re only just beginning to understand how the brain might work! While we may agree that the environment shapes us, we want to understand how. Both the structure and the function of our brains are central this understanding: the science of epigenetics is entering a golden period. in a more profound way than she could ever imagine. Knowing this is particularly relevant to the study of the effects of child abuse, neglect, and trauma…as each of these early childhood experiences can lead to an increased risk of substance use disorders. Imagine if we can understand and then address brain changes. How might science be applied to help alleviate human suffering? Questions for us or about the book? If you have any additional questions that you’d like to ask, please post them in the designated section at the end of the page. We value all of our reader’s feedback and do our best to provide personal and prompt response to your legitimate inquiries.